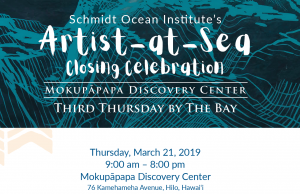 The Mokupāpapa Discovery Center in Hilo will display artwork from the Schmidt Ocean Institute’s Artist-at-Sea program from Dec. 7, 2018 through mid-February 2019. The exhibit features more than 50 pieces of artwork made from and inspired by local artists who participated on science expeditions aboard Falkor, the institute’s research vessel. 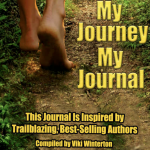 Artwork includes watercolor paintings, drawings, photography, fiber art, resin art and data visualizations. The exhibit will be on display with a “For the Love of the Ocean” closing event around Valentine’s Day. “Lava Flows” by artist Sarah Caudle. Featured artist Michelle Schwengel-Regala is a fiber artist with an active studio and practice in Honolulu, Hawai‘i. During her ocean voyage she explored numerous ways to intertwine data and fiber art, offering novel perspectives prompting conversations about the natural world. 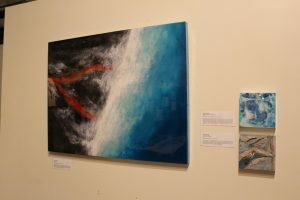 Her featured work provides a three-dimensional and conceptual look at water columns explored in low oxygen ocean zones. Other local artists Kirsten Carlson and Jessica Orfe use watercolor and illustration to explore the tinier organisms of the sea, bringing to life the mysterious world of plankton and microbes. Sarah Caudle also brings her unique seascape resin art with an exclusive new piece, Lava Flows, that depicts the recent Hawaiʻi Island events with lava flowing across the lands and into the cooling sea. 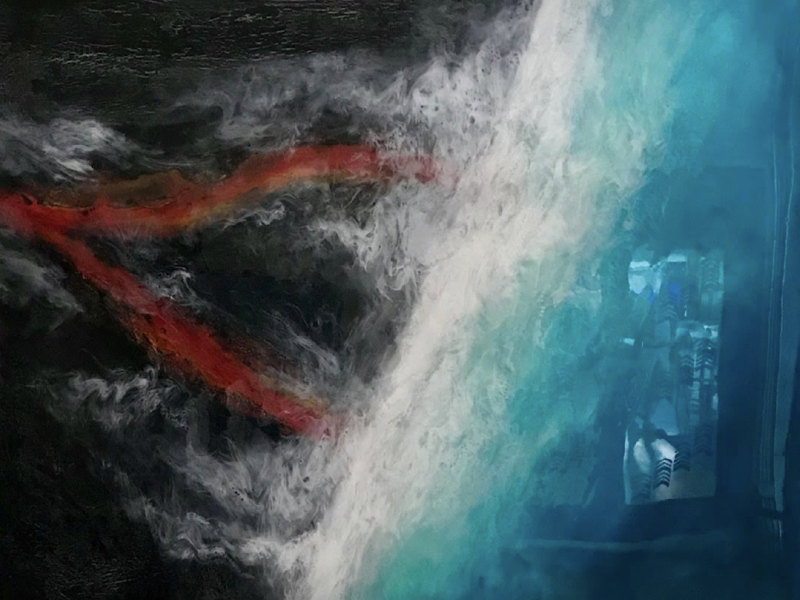 The Schmidt Ocean Institute, a nonprofit foundation established to advance oceanographic research, operates its Artist-at-Sea program to apply artists’ storytelling abilities to ocean science and conservation. The program provides a platform where experts from different disciplines are brought together and cross-pollination of ideas can transform both the scientists’ and artists’ work. Priority goes to artists who incorporate elements of technology or cutting-edge methods into their techniques or media. Artists work side-by-side with scientists to produce meaningful collaborations. Artists immersing themselves in day-to-day ship life are asked to tie these experiences together through conceptualization, data collection and application. The Institute currently has an open call for 2019 participants. NOAA’s Mokupāpapa Discovery Center is the interpretive facility for Papahānaumokuākea Marine National Monument and World Heritage Site and is operated by NOAA’s Office of National Marine Sanctuaries in collaboration with the National Marine Sanctuary Foundation. 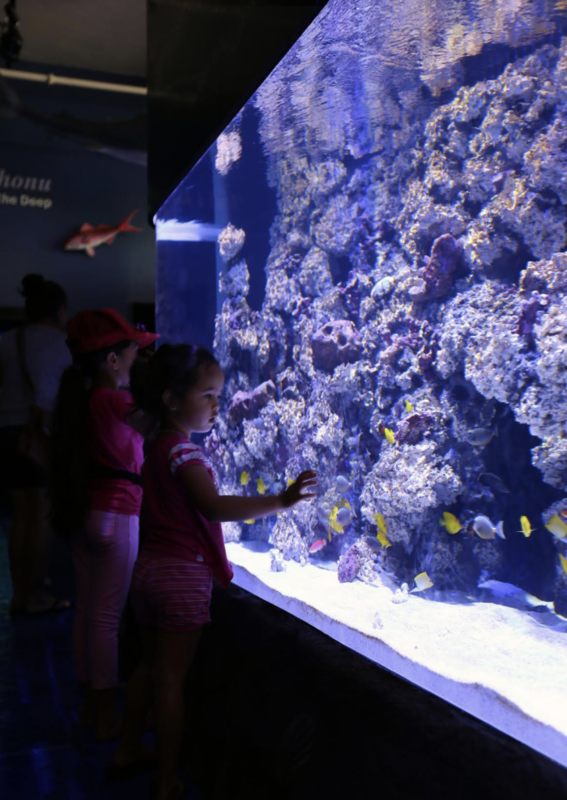 Since 2003 more than 700,000 visitors have learned about the unique natural and cultural features of the Northwestern Hawaiian Islands through the center’s exhibits, artwork, 3,500 gallon aquarium, hosted presentations and films, interactive exhibits, and guided tours. 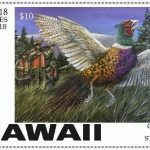 The center is located on the Hilo Bayfront at 76 Kamehameha Ave, is free to the public, and is open Tuesday through Saturday, 9 to 4 p.m.
To learn more about the Artist-at-Sea program, go online.